The kitchen is where we gather – to create delicious food, enjoy each other’s company and spend quality time together. Our Team Building Workshops offer the opportunity to work together, enjoy a memorable event and enjoy delicious food! We have four great team building options available. 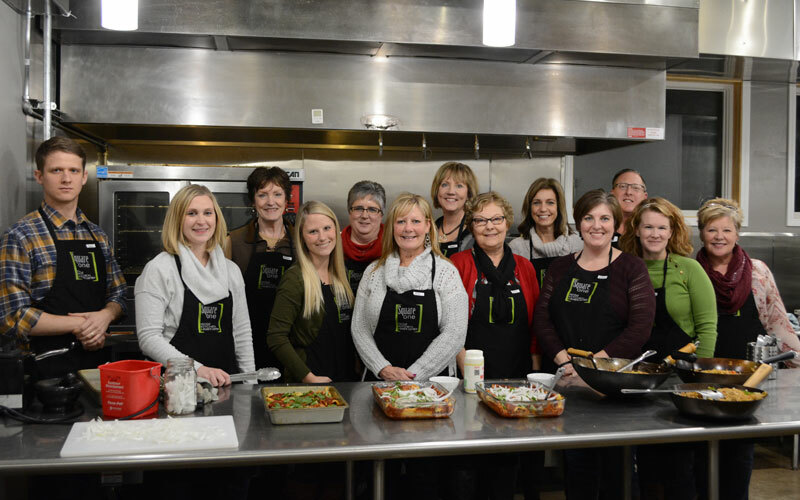 Cooking Together: Your crew will be set up into teams and each team will be responsible for preparing one of the meal’s courses with guidance from our chef instructors. 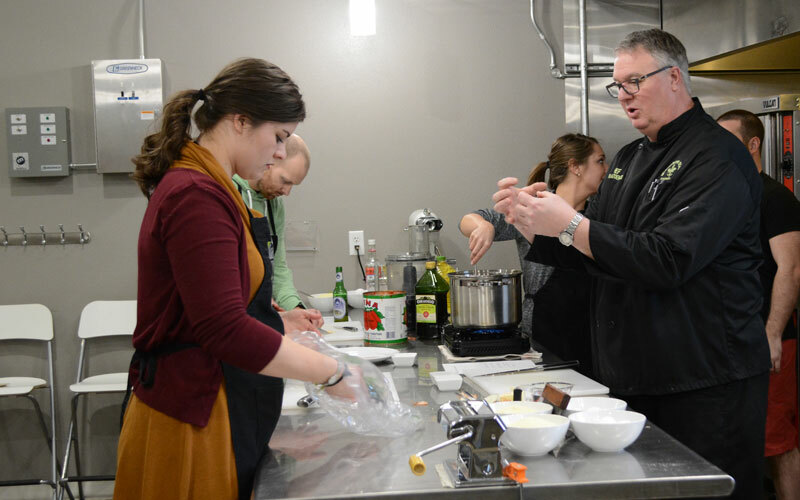 You will work together to create a delicious meal with the help of our instructors, learn new techniques, fresh recipes and then enjoy the food you have created together in the seating area at Square One. We have numerous menu options available and can accommodate various group sizes as well as dietary restrictions. For groups of 12 to 25 participants. 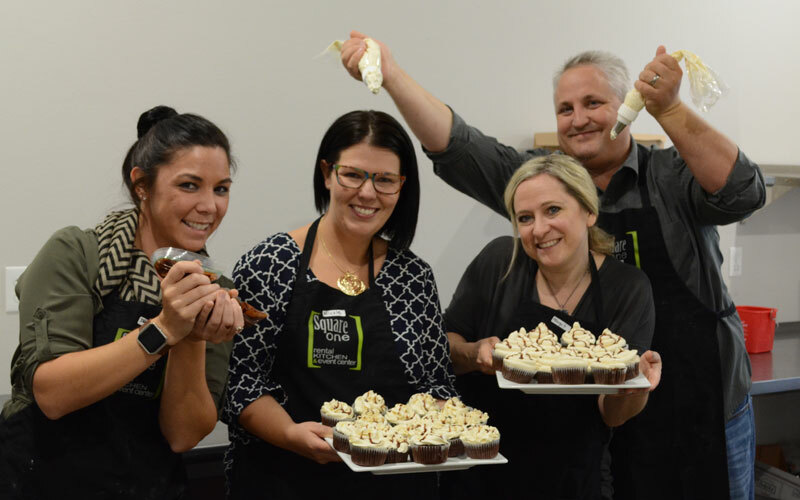 Cupcake Challenge: Utilizing a pantry of unique ingredients, each team will develop their own custom cupcake and frosting flavor to be judged. This is a creative way to pull yourselves out of your comfort zone and see what you can make happen in the kitchen! Each team will be judged on cake flavor, frosting flavor, presentation and overall product. For groups of 8 to 16 participants. Cheese-Centric Team Building: Join Megan Lewis, Owner and Cheesemonger of Milk Made Catering, as she teaches your team about the ins and outs of the world of cheese while building beautiful cheese platters for each participant to take home. Perfect for groups of 6 to 35 participants. Private Cooking Classes: For groups of 6-14 we offer a handful of private cooking class options. These operate similar to our public classes where you work together, hands on in the kitchen, to prepare a delightful meal with the chef instructor educating you throughout the class. It’s a great way to get your team in the kitchen, making delicious food and learning. Contact us for more information, pricing, etc. and to learn more about this great team building option! Everyone had a great time – thank you for a memorable evening! Schedule a team building class today! Talk to Casey today for more information and to schedule a custom class!